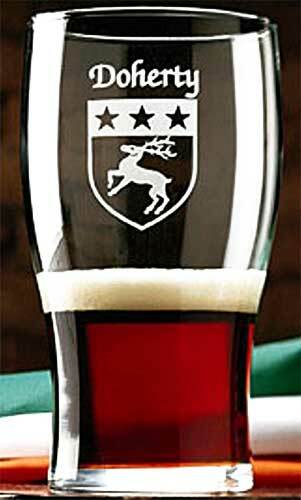 Irish coat of arms glasses are a tavern style design that are ideal for your favorite beer. When you select a name that requires an apostrophe, such as O’Shea, from the drop down menu, you will notice that the apostrophe has been omitted. Do not worry; the selected name will be spelled correctly on the Irish coat of arms glasses with the apostrophe included when required. These Irish beer glasses are permanently sand etched with the surname along with the coat of arms image. The Irish coat of arms beer glasses are received in a boxed set of four, 20 ounce, tavern style glasses that are dishwasher safe. The beer glasses are made in the United States; you may choose from over 900 different Irish coat of arms. The Irish coat of arms glasses are a special order item that ships directly from our supplier; please allow 2 weeks for delivery. Enjoy your favorite beer from these pint style glasses with your Irish coat of arms. 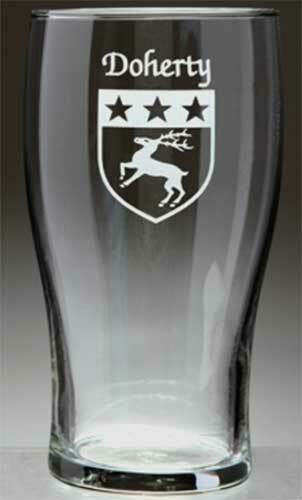 Irish coat of arms glasses are a tulip style pint design that are ideal for your favorite beer.